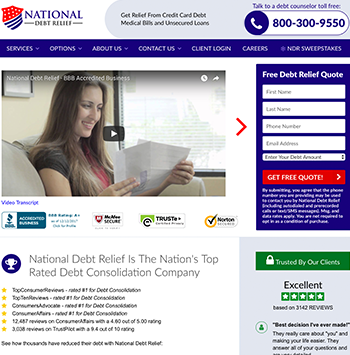 National Debt Relief was founded in 2009 to assist consumers with settling their secured and unsecured debt. They hold quite a few industry accreditations, including those from AFCC (American Fair Credit Council) and IAPDA (International Association of Professional Debt Arbitrators). National Debt Relief accepts a minimum amount of $7,500 in unsecured debt and takes roughly 2 to 4 years to settle. They provide you with detailed information, including their consumer rights and fees. You can also work with personal advisors and have the ability to track your progress through an online account and mobile app. National Debt Relief is accredited by the American Fair Credit Council (AFCC), which makes sure the company is upholding FTC regulations, and the International Association of Professional Debt Arbitrators (IAPDA), which offers training and certification for arbitrators. They are accredited by the Better Business Bureau with an A+. You can track your progress through an online dashboard or mobile app. National Debt Relief serves 41 out of 50 states. They work with both secured and unsecured debt. Secured debt includes items such as private student loans, which is rarely taken care of in the industry. They offer a 20% fee which is comparable to their competitors. They provide free consultations over the phone. A $7,500 minimum debt is required, which is an industry average. Customers have reported National Debt Relief provides reasonable costs, professional support, and refunds. The average reduction rates are generally higher than other companies. National Debt Relief has a history of debt settlement that is 30 - 50% less than what customers owe. National Debt Relief’s website provides transparency on the hard truths, legal information, and process of debt consolidation. They also offer their clients a glossary to define any legal terms, educational videos, and FAQs. They can be contacted through phone or email. National Debt Relief has no permanently assigned representative, which could make progress and support inconsistent and make it frustrating to speak to a new person every time you call. There is no live chat option for customer support. Although they are a reputable company, they are not accredited by the USOBA (United States Organizations for Bankruptcy Alternatives). To sign up, you can fill out a form online at https://www.nationaldebtrelief.com/apply/ before being contacted by a debt specialist. National Debt Relief provides a free consultation to go over pricing, which is generally 18-25% of the total enrolled debt. The overall debt reduction is an average 30%. Once enrolled, you make a small monthly payment that goes to a personal account that assists in paying off debts. Like many other debt consolidation companies, National Debt Relief is compliant with the FTC and does not charge advanced fees and only for work that has already been done. Unlike their competitors, they do not charge monthly account maintenance fees. Fees are generally 18 - 25% of the enrolled debt.